Methopedia is meant as a resource for trainers who want to make their seminars more active by using different seminar methods. As educators we often wonder how active learning can be accomplished in larger groups, how online learning episodes can be organised during e-learning or what can be done to liven up a face- to-face seminar. Methopedia provides different methods for that such as Webquest, Jigsaw Puzzle, ABC lists, station learning, or ice breakers like “Funky Questions”. In order to find the right method for a specific situation from over 100 possibilities, you can search in categories or combine categories such as “beginning of a seminar” and “online learning”. On the web and in the literature there are many such method pools, however they all have the disadvantage, that the user, i.e. the trainer, cannot change them. The methods in Methodpedia are therefore provided with a certain structure. However, the wiki allows everybody who registers, to change the description of the methods and enrich it with examples, comments, links, presentations or videos. What is the idea behind the methods? Many of us know formal learning as the passive reception of information in form of lectures, talks or presentations (which don’t get any better by using power point). Or as learning for an exam with a certain stress “kick” which helps us to finally learn the material. However after some time – hopefully after the exam – learners realize that they have forgotten a lot of what they had learned. Is there no other way? The methods in Methopedia and their adaptability by the user can make a contribution for learning to be more cooperative and individual and thus contribute to the overall learning progress. “The reviewed studies showed that learner-centred guidance, group work and inquiry projects result in better skills and competencies and that interactive forms of e-learning can lead to a more reflective, deeper and participative learning, learning-by- doing, inquiry learning, problem solving, creativity, etc all play a role as competencies for innovation…”. 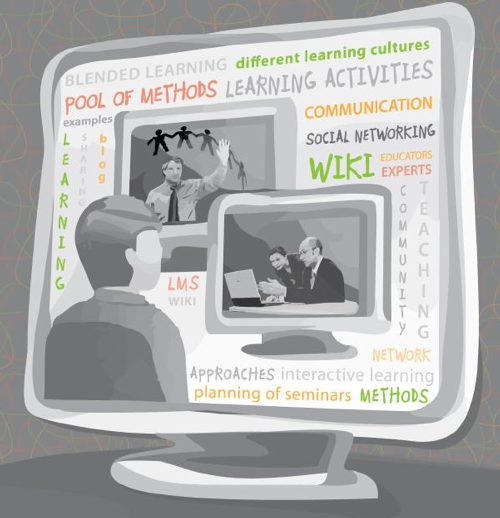 We would like to invite you to the world of methods and collaborative learning. Try some methods, write us your opinions, tell us about your experiences and changes in Methopedia and tell your colleagues about it. We hope you find working with Methopedia fun and rewarding!